Have You Read Passion Pirates of the Lost Galaxy? Commander Dirk Moorcock is hero to the galaxy. He stops mad scientists, seduces bad girls to become good and saves the universe on a regular basis. When the Empress gives him an experimental warp drive to go to a distant galaxy in pursuit of the pirate, Zoddom, Dirk doesn’t hesitate to save the universe again. Okay, that is not true. He hesitates a lot but because he is a hero, he still does it. 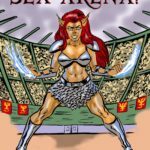 Along the way, he encounters triple-breasted warrior women, savage and lusty pirates and a heroic rebellion comprised of the old regime’s marching band. 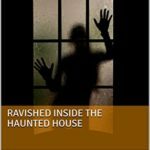 Wacky adventures and daring escapes abound! This is an interesting book to read. On the one hand, names like Moorcock and Major Wilma Wonders suggest that this book is a silly parody. On the other hand, the plotting and excellent pace is a perfect recreation of the pulp sensibility. There is comedy all through the book but it never quite crosses over into wacky comedy like Spaceballs or a Naked Gun movie. The space opera theme helps as the most ridiculous elements feel completely normal in the outlandish setting. The cover mentions adult adventures and sexual themes are certainly discussed but the book never gets explicit. 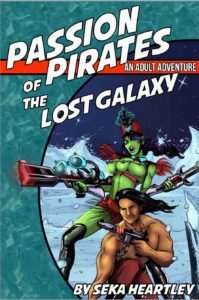 Passion Pirates of the Lost Galaxy is a fast read and was a lot of fun. If you want to read pulpy space opera with flirty adult fun, this book is perfect. Have You Read Don’t Meddle With My Daughter? Have You Read the Dictionary of Mu?